High electricity bills are a challenge in every corner of Australia, including Western Australia’s south coast. Ron and Carolyn Chambers, owner of the Pink Lake IGA and Esperance Supa IGA, found themselves paying higher and higher electricity bills each month. They decided to take advantage of the SEDAC Energy Management energy efficiency audits through the Metcash Sustainability@Retail program which helps all Metcash businesses in every part of Australia lower their electricity bills with energy efficiency projects. south coast. Ron and Carolyn Chambers, owners of Pink Lake IGA and Esperance Supa IGA, found themselves paying higher and higher electricity bills each month. They decided to take advantage of the SEDAC Energy Management energy efficiency audits through the Metcash Sustainability@Retail program which helps all Metcash businesses in every part of Australia lower their electricity bills with energy efficiency projects. After the completion of the installation Mr Chambers stated “SEDAC EM made this process easy. They helped me secure the financing deal that has made this project cash flow positive from the start! The savings are a great bonus to our bottom line.” The solution will save Esperance Supa IGA approximately 13,200kWh per annum and Pink Lake IGA approximately 98,400kWh per annum! This equals financial savings totalling $32,485 for Esperance Supa IGA and $41,580 for Pink Lake IGA based on recent bills. Both sites now have the control and visibility needed to benefit from future upgrades on capital plant and equipment and needed to maintain energy savings year after year. SEDAC EM confirmed that the two IGA sites had high voltage on their incoming electrical mains. After analyzing the returns on investment, SEM determined that each site would see great paybacks from voltage optimisation. The Voltage Optimisers have reduced the incoming voltage and improved consumption on each site’s inductive load. New LED tubes in the refrigeration cases look great! 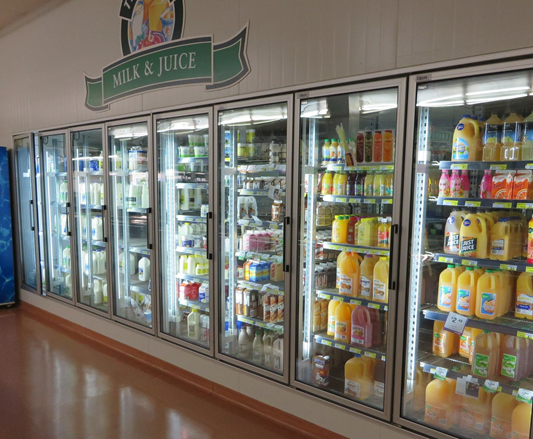 LED tubes were installed to the refrigeration and freezer cases to replace the high consuming existing fluorescent lights. Automated lighting control was installed for internal and external lighting which included zoning areas based around time schedules, staff occupancy and daylight sensing. The installed system has removed all operational inefficiencies and ensured that all lighting areas are controlled efficiently. This lighting system will not only increase the lifespan of lighting but also allow staff to concentrate on sales rather than operations. SEDAC EM completed full re-commissioning of the refrigeration system to ensure it operates at its most efficient. Both sites were completely optimized to their full capabilities whilst ensuring no risk to product, plant or equipment. SEDAC EM installed a new submetering system to accurately track consumption at each site. The submetering system enables owners to quickly identify when assets are consuming too much electricity and have maintenance fix the issue. The SEDAC Energy Management System accurately measures the savings and ensures that an optimum baseline is sustained for the site. The improved visibility also assists with identification of potential issues and allows Carolyn and Ron Chambers and SEDAC Energy Management to rectify them. The SEDAC Continuous Review Process is completed whereby issues identified are reported and then followed up with site to ensure technical and operational inefficiencies are rectified. SEDAC Energy Management projected an 15% and 14% reduction in the total site electricity consumption at Pink Lake IGA and Esperance Supa IGA, respectively. However, we have been seeing an even better than expected result. The project tracking software used to calculate site savings year on year, adjusted for variations in weather and store conditions, has calculated that both sites are currently saving 25%. The increased savings have reduced the original payback of 2.4 and 2.5 years to a revised payback of 1.51 years for Pink Lake IGA and 1.92 years for Esperance Supa IGA. This figure is conservative since we do not take any energy price increases or reduction in maintenance costs into account. The below graph shows the daily total site consumption for the past 12 months. The yellow lines show daily consumption before the site was optimized, and the blue lines show daily consumption after the project was completed. The increased savings have reduced the original paybacks of 2.4 and 2.5 years to revised paybacks of 1.51 years for Pink Lake IGA and 1.92 years for Esperance Supa IGA. This figure is conservative since we do not take any energy price increases or reduction in maintenance costs into account. We’re often asked if the savings we achieve on site translate into real monetary savings. The recent electricity bills from these two stores show that energy efficiency definitely provides monetary savings! Pink Lake IGA’s recent electricity bill showed their daily electricity cost was $361.89 for the month. In the same period last year the store’s bill listed a daily electricity cost of $475.81. So the store is saving over $100 a day! Esperance Supa IGA is showing similar savings with a daily cost of $516.73 on their recent bill versus $604.98 during the same period last year. The savings pay for the Energy Smart Financing loan, and there is plenty left over to boost the bottom line! Ron and Carolyn Chambers wanted to see the savings right away from their energy efficiency investment. So, they chose to use Energy Smart Finance to fund the energy efficiency works at these two stores. With financing, they were able to invest a greater amount of capital in the projects to cover more expensive items like the voltage optimisers, which allowed them to see increased savings. As you can see in the red line on the chart to the right, the cash flow from the financing is positive from the beginning since the savings are greater than the loan costs. Each month, the Chambers save money on electricity. They can use the money saved to make the loan payment and still have savings left over for his bottom line. With better than expected savings, the Chambers are seeing even greater than expected positive cash flow! 2. Cultural change By improving the staff’s understanding of site operations and involving staff directly in operational improvement, staff reported that they learned more about how the site worked. Their involvement has led to greater opportunity to improve operations and procedures. 3. Community recognition The energy saving and CO2 reduction data collected from this site can be submitted for various industry awards and to demonstrate to the wider community that Pink Lake IGA and Esperance Supa IGA are continually setting higher standards for energy efficiency. 4. Energy Savings A 25% reduction in total electricity usage was achieved using the SEDAC EM approach. The data and savings were obtained using sub meters plus tariff meter data which allowed SEDAC EM to provide the client with accurate energy savings results. These results will be sustained over time, making this an investment that provides financial returns for years.